Gurkanwal Bharti is not your average 18-year-old. For one, she has tens of thousands of fans on YouTube and Facebook who keenly follow every musical performance she uploads. Her comments section is full of adoring fans: “Love you Ginni” is a frequent one, a nod to her stage name Ginni Mahi. Other comments range from “God bless you” to “Jai Bhim”. You see, Ginni Mahi isn’t your regular singer of the ever-popular Punjabi hip-hop or rap. Her songs are rooted in Punjabi folk tunes and extol the virtues of BR Ambedkar and Sant Ravidass, both powerful Dalit icons. Mahi’s family belongs to the Ravidassia faith, founded out of Sikhism, that believes in the oneness of God. The teachings of Ravidassias are compiled in the Amritbani Guru Ravidass Ji, the community’s holy book. Mahi’s songs are, for the most part, shabads or hymns written in praise of her Guru. The moment feels like a quiet victory. Here is a young Dalit woman powerfully asserting her voice and, moreover, saying that her voice needs to be heard over savarna ones and over the band of men that threaten to drown her out. Born to Rakesh Chandra Mahi and Paramjeet Kaur Mahi in Jalandhar, Punjab, Mahi realised that she wanted to be a singer at a very young age. She remembers going up to her father and saying, “Papa, ek gaana sunau? (Papa, shall I sing you a song? )” Her doting father, who changed his children’s surnames from Mahi to Bharti because he says he wanted them to be remembered for being Indian above all else, thought there was an element of magic in her voice and endeavoured to take her to every music producer he knew. They eventually found a champion in Amarjeet Singh of Amar Audio, who has produced both of Mahi’s albums, Guran di Deewani and Gurpurab hai Kanshi Wale Da. Surrounding Mahi is a team of family members committed to turning her dream into a reality. Her team consists of members of her joint family, especially her mother, father and chachi (aunt), who listen to hundred of songs before deciding which ones Mahi should sing. The team has focused exclusively on songs with Dalit pride messages so far, but Mahi’s father says that they aren’t restricting themselves to devotional songs. He says, “Thodi pehchaan banane ke liye humne devotional songs chune (We chose devotional songs to cultivate her identity). Mahi considers her songs to be extremely important in reminding her community to remember their Guru. “Unhone apni taraf se sirf Dalit samaj ke liye nahin, par pure world ke liye kaha tha ki mein aisa raj chahta hoon ki jahan par kissi tarah ka bhi bhed-bhav na ho. Equality sabhi ko mile (From his side he [Guru Ravidass] did not just talk for the Dalit community, he said it for the whole world that I want a dispensation without caste discrimination, where everyone is equal),” she adds. In her song Danger 2 she repeats this message. She takes the unpleasantness usually associated with her caste name (Chamar), often used as a slur, and turns it into something empowering, a tag of pride. 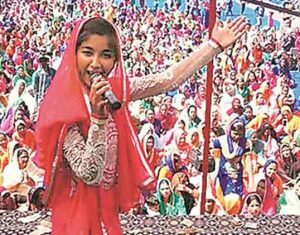 She’s mindful of the support she’s received from her community and says that her songs are a way of promoting her “Dalit samaj” and religion. She recently cleared her class 12 examinations with an aggregate of 77 percent and is now beginning her first year at college. Her family is adamant that she complete her education, even as she dreams of conquering the hearts of millions of Indians with her singing. Budding playback singer she may be, but for now, Mahi also has college to worry about.